Exchange your vows on a beautiful secluded beach in South Maui. The perfect romantic solution for couples who come to Maui to elope. 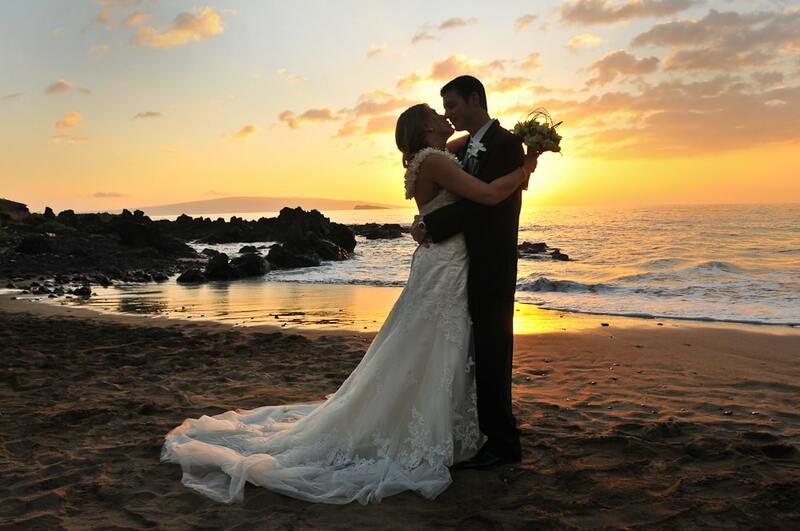 Your ceremony takes place on a beautiful Maui beach at sunset or during the day. Our ministers or officiants are non denominational and marry all faiths. You may choose which minister or officiant fits your lifestyle. The flowers included in this package are the traditional Hawaiian leis, usually a Maile leaf lei for the groom(s), a six foot lei made from fragrant leaves, and a beautiful two strand tuberose for the bride(s). If you wish, we can substitute other leis that match your color scheme. You may also order a variety of bridal bouquets, hair flowers, Haku head leis or boutonnieres. If you have guests, fresh flower leis are included for them. Hair & make-up artist services are also provided at your hotel room or condo. Your professional photography includes ceremony, formal and candid shots after the ceremony. Your photography package includes 28 images digital download. Additional photography options are available. After your wedding we can arrange reservations at a nearby restaurant, just let us know what sort of food you like. We start with our Molokini Sunset Wedding service, we include hair and make-up in your room, deluxe Hawaiian leis to exchange and bridal bouquet if you choose, plus beach wedding permit and insurance. You can customize your wedding with a number of options. This is truly the ultimate island wedding experience. You set sail out of Lahaina or Maalaea harbor on a private yacht for a spectacular two hour cruise. 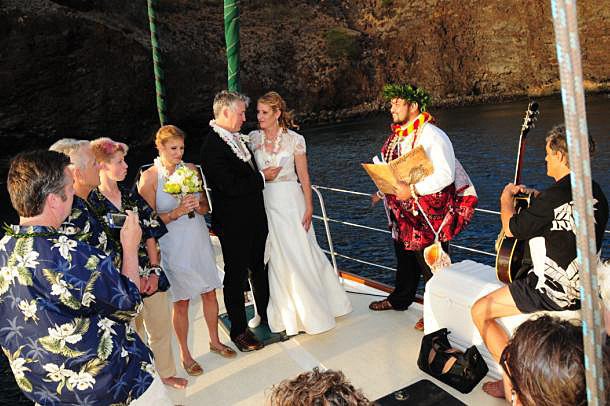 Exchange your vows on the bow while dolphins and whales frolic admist the tropical Pacific. A Whale of a Wedding*! This is truly the ultimate island wedding experience. You set sail out of Lahaina or Maalaea harbor on a chartered yacht for a spectacular two hour cruise. You will depart between 3:00 PM and 4:00 PM, depending on the time of year. The ceremony takes place on the bow of the yacht and is performed barefooted. limited to 6 passengers aboard the yacht. If you have more guests, we can provide for a larger yacht at an additional cost. The flowers included are: Two matching baby rose leis, one for each of you and a matching hairpiece or Haku head lei for the bride9s). If you wish we can substitute other flower leis that match your color scheme. You may also order a variety of bridal bouquets, corsages, hair flowers, Haku head leis or boutonnieres at an additional cost. If you have guests you may want to order additional flower leis for them as well. Just let us know what your needs are and we´ll be happy to arrange it for you. Your wedding photography includes ceremony, formal and candid shots after the ceremony. Your photography package includes 48 4x6-sized images digital download. Your photographer will take a number of images of which you choose the final 48 images. Your ceremony and cruise are also videotaped and made into a professionally edited production. Also included is a singer/guitarist who adds to the celebration throughout the sail. Just suggest favorite songs and chances are he will know them. He will also perform the Hawaiian Wedding Song during the ceremony. Champagne and "pupus", appetizers, are included throughout your cruise. We start with our Sunset Sale Wedding service, officiant, musician, photographer, videographer and crew are aboard. Enjoy cocktails and appertizers prior to exchanging your vows in a protective cove. *Whales are spotted during whale season December-May. Fit for a King & Queen! Our Traditional Hawaiian Wedding includes everything you want to add to your beach wedding. Enter the beach with your Hawaiian entourage. Be a Hawaiian Queen on your Wedding Day! A wedding in ancient Hawaii was always full of great fanfare. Royal Kahilis (handmade feather standards, a symbol of Hawaiian royalty) were carried in a procession. A conch shell is blown in all directions to summon the Gods and begin the ceremony. 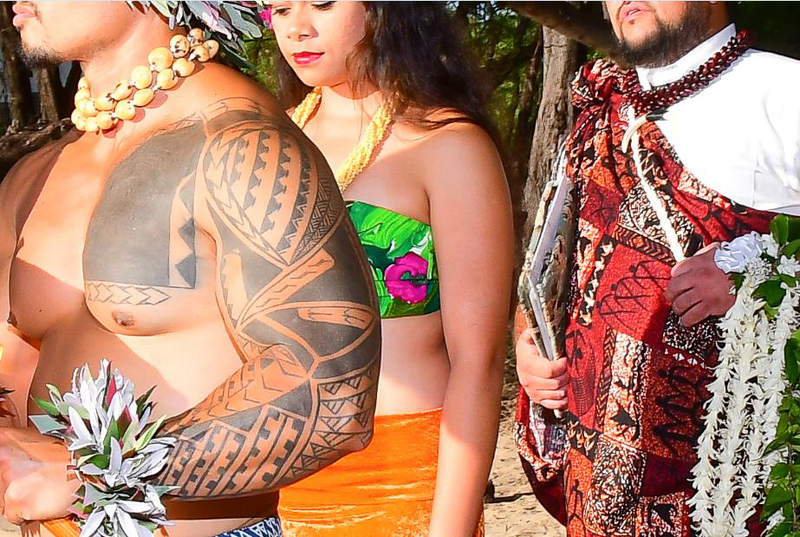 Musicians and the beautiful language of Hula tell the story of the couple in song and dance. Our Traditional Hawaiian Wedding includes all of the royal ceremony of ancient Hawaii. The procession begins with the blowing of the conch shell. Kahili bearers, minister, hula dancer and the joyous couple proceed from a small alcove to a beautiful Maui beach at sunset as guests await the procession. The ceremony begins with the playing of the Hawaiian Wedding Song as the hula dancer performs for you. Besides the Hawaiian Wedding Song your musician will play two songs of your choice during the ceremony - and another after the ceremony. Our Traditional Hawaiian Wedding service, Six Hawaiian entertainers (2- kahili bearers, 1- conch shell blower, 1- hula dancer, 1- musician., 1- minister) professional photograohy and video, and coordinator to cater to your needs as you are treated like Hawaiian Royality.